Yesterday’s foul weather finally gave way to a bright warm sunny day today. Such fine day gives an urge to go out to enjoy the good weather. I visited the home of a friend whom I had not seen for ages. Come to think of it, visiting someone’s home in japan is a very rare chance for me and especially its someone that I haven’t been seeing for years. I must have gotten too excited and all I could remember was that I was talking, eating and drinking non-stop. I had a whale of a time. The home is very cozy. On top of the furniture and layout, in my opinion, a bit of decorations here and there certainly does the additional work. I must say I have no idea when it comes to home decorations. I thought I have no sense and so, I couldn’t be bothered with it. But obviously, you don’t need to be an expert for some minor transformations. 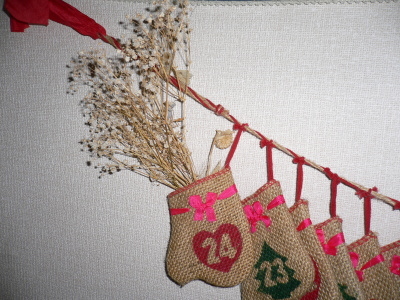 All it takes is a bit of imaginations, a bit of effort and a few playful touches. I picked up a few items that I thought seems interesting. 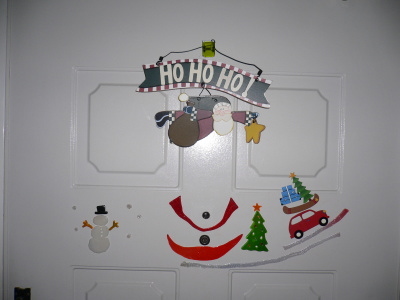 Some decorations on the door to greet you to start your morning with before heading off to work. 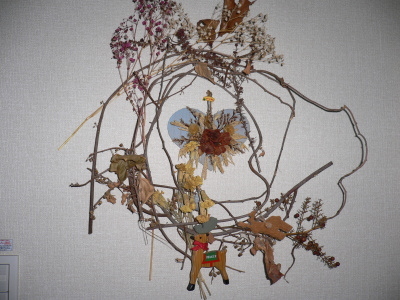 Didn’t know that the combination of dry flowers, twigs and small little decorations can turn into something creative d(^o^)b.
Oh no! All I know is that this was from Germany. Don’t ask me what it is because I was too busily trying to take pictures than listened to the explanation (￣へ￣|||) .And by the way, the numbers ended at 24. 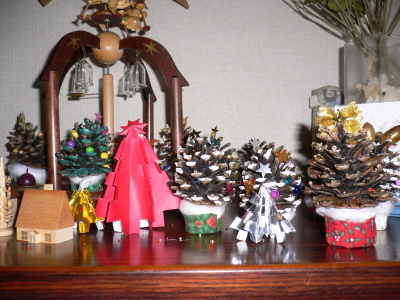 With a few imaginations, even old plain pine cones can turn into wonders. Good company, good food, good weather what other else to ask for? 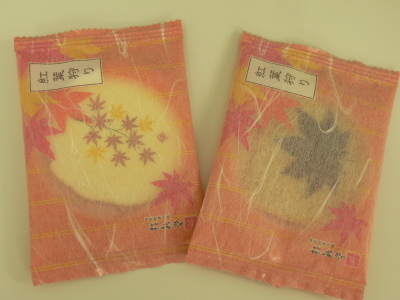 Moreover, I was presented with special souvenirs (rice cracker). 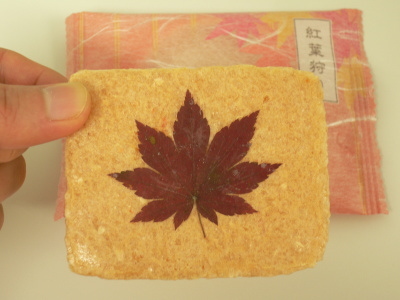 A deserved to be mention is that the cracker come with a momiji (maple leaf)! WOW, its really beyond beyond description. Creative! Finally, I knew that maple leaves ARE EDIBLE. It just tastes like ………… leaf, that’s all (LOL). Of course, the cracker is nice.